Software, in broad terms, is a set of instructions (generally referred to as code), that is positioned between you and the device’s hardware, enabling you to use it. But what is computer software, really? In layman’s terms, it’s an invisible component of a computer system that makes it possible for you to interact with the computer's physical components. Software is what allows you to communicate with smartphones, tablets, game boxes, media players, and similar devices. It’s important to note that there is a distinct difference between hardware and software. Software is an intangible resource. You can’t hold it in your hands. Hardware consists of tangible resources such as mice, keyboards, USB ports, CPUs, memory, printers, and so on. Phones are hardware. iPads, Kindles, and Fire TV sticks are hardware. Hardware and software work together to make a system functional. While all software is software, your day-to-day use of software likely comes in two ways: One is system software and the other is as an application. The Windows operating system is an example of system software and comes preinstalled on Windows computers. It’s what lets you interact with the physical computer system. Without this software you wouldn’t be able to start up your computer, get into Windows, and access the Desktop. All smart devices have system software, including iPhones and Android devices. Again, this type of software is what runs the device, and enables you to use it. Application software is the second type and is more about the user than the system itself. Application software is what you use to do work, access media, or play games. It’s often installed on top of the operating system by computer manufacturers and may include music players, office suites, and photo editing apps. Users can also install compatible third-party software. Some examples of application software include Microsoft Word, Adobe Reader, Google Chrome, Netflix, and Spotify. There’s anti-virus software too, at least for computer systems. And finally, apps are software. 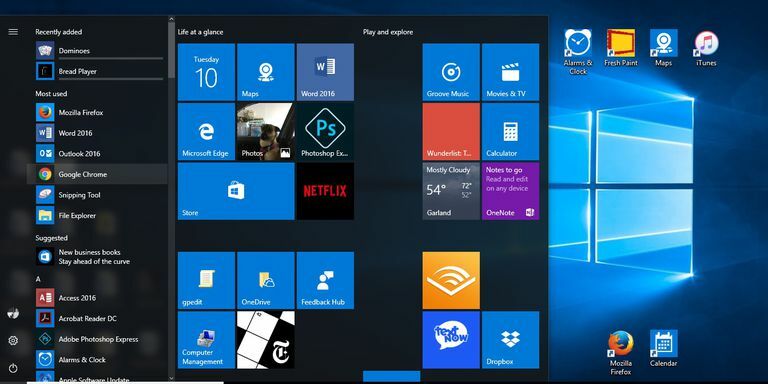 Windows 8 and 10 support apps, as do all smartphones and tablets. The definition of software implies that someone must sit at a computer somewhere and write the computer code for it. It’s true; there are independent coding experts, teams of engineers, and large corporations all creating software and vying for your attention. Adobe makes Adobe Reader and Adobe Photoshop; Microsoft makes the Microsoft Office Suite; McAfee makes antivirus software; Mozilla makes Firefox; Apple makes iOS. Third parties make apps for Windows, iOS, Android, and more. There are millions of people writing software all over the world right now. Operating systems come with some software already installed. In Windows 10 there’s the Edge web browser, for instance, and applications like WordPad and Fresh Paint. In iOS there’s Photos, Weather, Calendar, and Clock. If your device doesn’t have all of the software you need though, you can get more. One way a lot of people get software today is downloading it from specific stores. On the iPhone for example, people have downloaded apps around 200 billion times. If it's not clear to you, apps are software (perhaps with a friendlier name). Another way people add software to their computers is via physical media like a DVD or, back a long time ago, floppy disks.